Italy already qualified for round of 16 took on Republic of Ireland in the last set of group games of 2016 European Championship. Republic of Ireland needed a win to confirm their place in the final 16 and they did just that in what was a historic performance by the men in green. A very competitive first half saw Ireland dominate in terms of chances and bit unlucky as referee denied them a clear penalty but late in second half they finally broke the deadlock to win the game 1-0 thanks to Robert Brady’s goal. 85′ 0 – 1 Robert Brady scored late in the secon half with a close range header to make history for Ireland. Match Preview and Possible Lineups: Ireland will take heart from the fact that Antonio Conte is expected to go with a under-strength side with some of the fringe players getting a chance before they take on Spain next week. Ireland must win this game to get a chance of qualification to next round and their preparations has been hampered by the damaged pitch at Stade Pierre Mauroy. Neither Italy nor Ireland were able to train at the stadium as new pitch is imported from Holland. Italy will surely rest some of the senior players in the team with the likes of Captain Gianluigi Buffon, Giorgio Chiellini and midfield Daniele De Rossi given much needed rest. Lorenzo Insigne and Federico Bernadeschi are expected to start for Italy. Ireland on the other hand will play this game as their life depend on it. below are the expected lineups of both teams. 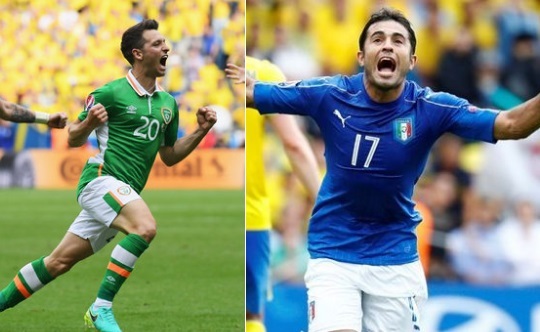 Match Predictions: Ireland need a historic performance to get the better of Italy in this must win game. In the opening two games Ireland performances has been contrasting from brilliant against Sweden to underwhelming against Belgium. Italy on the other hand will be without any pressure and they will be able to player more attacking and flair football. I am going with an easy for Italians in this one.